We just got back from a two-day private tour to Mekong Delta spending the night in a homestay (which was pre-arranged by Mrs Trang of Eviva tour). Different from the previous trip, we wanted to experience the daily life of local people in the Mekong Delta. “Abundant” is the best adjective to describe the delta. Created by alluvium of mighty Mekong River, the Mekong Delta is the biggest rice-growing region in the country and Vietnamese often refer it as Vietnam’s rice basket. The region is crisscrossed by the chocolate-coloured canals encompassing green fields and peaceful villages. This fertile delta nourishes the cultivation of not only rice, but also sugarcane, fruit, coconut, fish and shrimp which sustains life of its inhabitants. Everything grown in this land has its own purposes. For example, rice, fish and shrimps are used for daily meals; leaves are for salads and soups; fruit is used for desserts; banana stems are for rope and floating raft and water hyacinth is used for feeding cattle. Life of people here also depends on the river. With the help of our tour guide, it is not difficult to find a three-generation family that was born, lives and earns their livings in their vessels and homes on the water. Floating market of Cai Be is the most popular “work place” of people here. 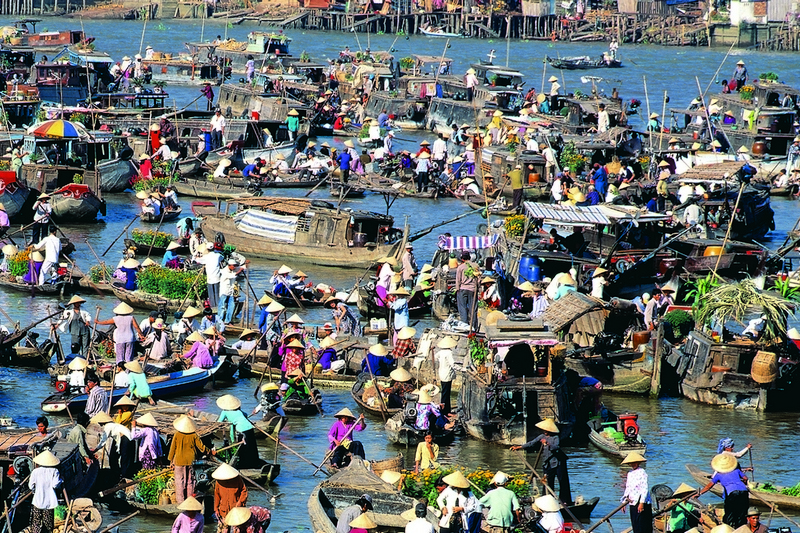 The daily life in Cai Be floating market starts from early dawn with noises and shouts of busy people and ends at noon. Dozens of boats carrying large amount of sugar cane, pineapples, jackfruit, pumpkins and vegetables were rowing around. Each boat has a tall wooden pole which displays a sample of what the boat’s owner sells, so that goods can be “advertised” and seen from a long distance. Besides, there were many boats offering local soups, snacks and even coffee for dealers and buyers attending the market. Customers generally use smaller boats which are filled with various products purchased. We spent our night at a local family who offered homestay options. Everything was very simple and pretty much as what we expected from a Mekong Delta homestay – no hot water, no TV and of course, no wifi. The host was open, friendly and easygoing. She showed us around the backyard garden and duck farm where she collected almost everything to prepare for our meals. For dinner we had a selection of delicious Mekong food including duck soup with bamboo and a deep fried fish with mango sauce that was freshly caught from the river outside the house. All was cooked perfectly and full of flavour. To accompany the main dishes, we had fresh salad, vegetables and lots of other tropical fruit. I have included some photos below showing all the weird but juicy fruits growing in the garden of our host family. 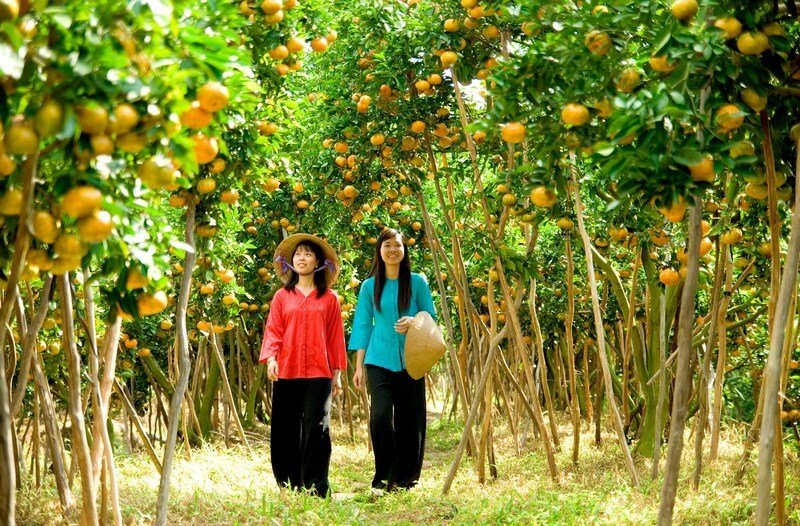 If you are planning to travel to Vietnam, I really recommend a Mekong Delta trip with home-stay to get a much closer insight into the way of life in this wonderful part of the world. Right at the waterfront of Mui Ne beach, Sea Links City Resort situates in a prime location on a hill which is 1000 meters above sea-level. Looked down from the sky, Sea Links City embraces the entire Mui Ne Bay. 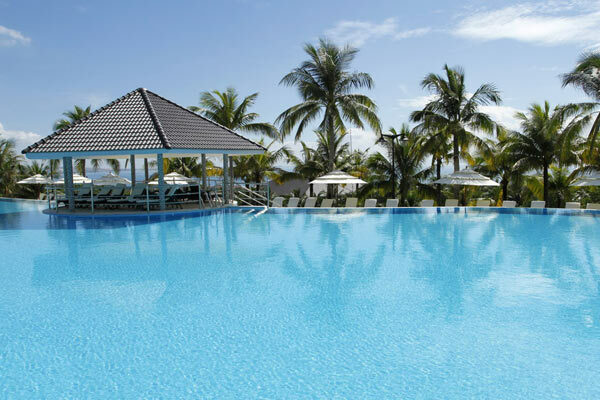 The resort with open modern plans offers you a spectacular paranormal view of the paradise bay. Here you can spend your day enjoy regular activities like sea bathing, basking, or reading by the beach. Besides, you may also want to take a stroll along the beach while the sun sets over the endless skyline. Visiting nearby fishing villages on a scooter is another choice for you. When the night falls down, you might want to gather around the fire, dancing, singing, and enjoy the freshly caught seafood. These experiences would definitely be unforgettable. Just about 3 kilometres from Phan Thiet city, hillside Takalau Resort hides under the lush green of coconut leaves. 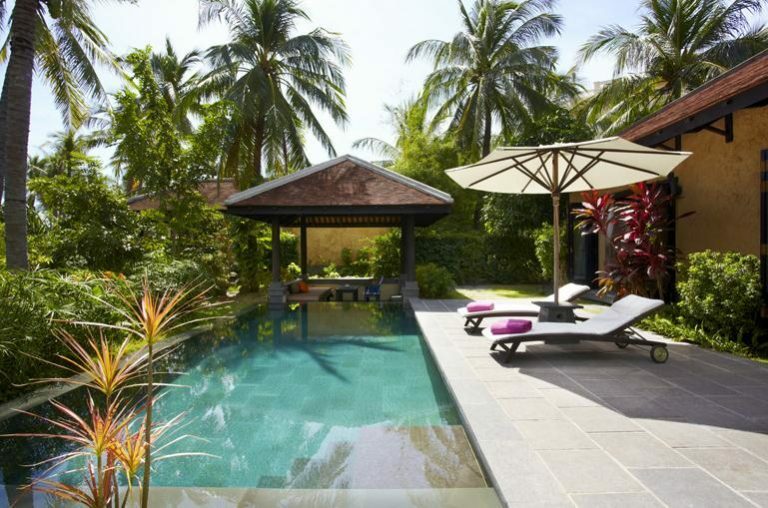 The resort comprises a number of villas with a unique design, a clever combination of classical and modern style embellished by Vietnamese traditional patterns. 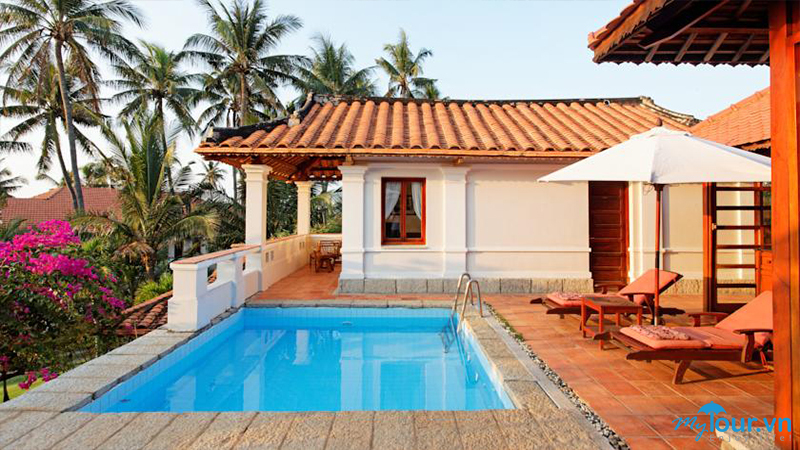 In addition, each villa has its own swimming pool, suitable for families and groups of friends who would like to be private. Someone might say, Takalau Resort looks like a giant flower garden. Indeed, you can spend your whole day wandering under a colourful curtain of Bougainvillaeas, lying on the soft grass reading your favourite book or swinging under the palms facing the cool ocean breeze. Such relaxation you hardly find elsewhere. The Cliff Resort & Residents sit comfortably atop the rocky and gentle slopes, offers you a breathtaking panoramic view of the ocean. 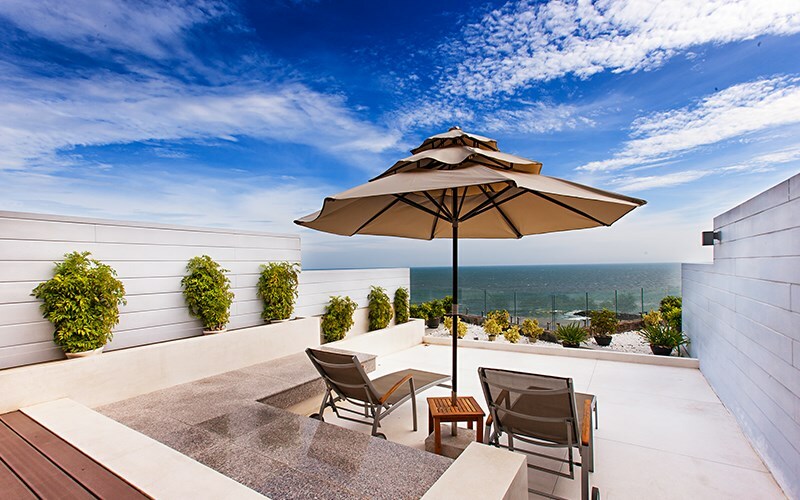 Accommodation options range from the Azul room with picturesque ocean vistas to the elegant Terra rooms, which boast a panoramic ocean view and sun deck. 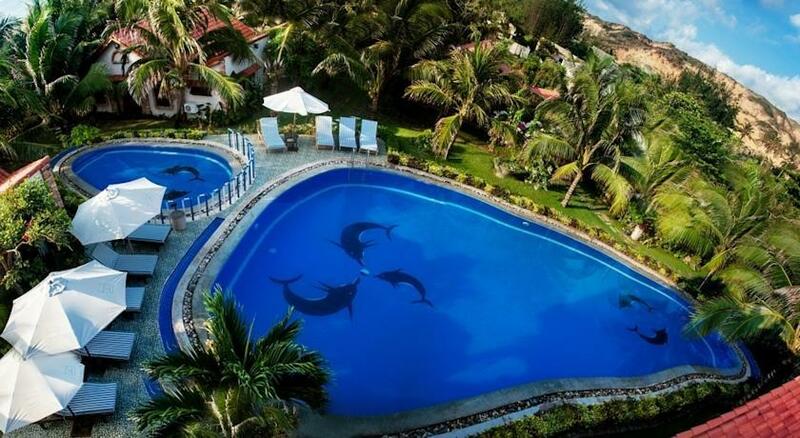 All offer you an unprecedented opportunity to enjoy the unbelievable natural beauty. The Cliff Resorts and Resident offers almost every service you can think of. From fancy restaurants and bars to the luxurious spa. From water sports like windsurfing and sailing to the area only reserved to watch the starry sky of Mui Ne. The complex will certainly meet your expectations. Only 30 kilometres from Phan Thiet, Princess D’Ân Nam Resort rests in the peaceful heart of Ke Ga Bay. Designed by world famous architect, Tan Hock Beng, this luxury resort is also home to an award-winning spa, two epicurean restaurants, a bar, serene pools, function rooms for private and corporate events, and heliconia-filled gardens. Spanning over 45 acres on a long stretch overlooking the East Sea, it is famed for its natural beauty – stunning mountains, red canyons, sand dunes, rich ecosystem – and its historic lighthouse built by the French in 1899. At the Princess D’Ân Nam, you can live your days in a relaxed and luxury environment personified just for your wonderful vacation. 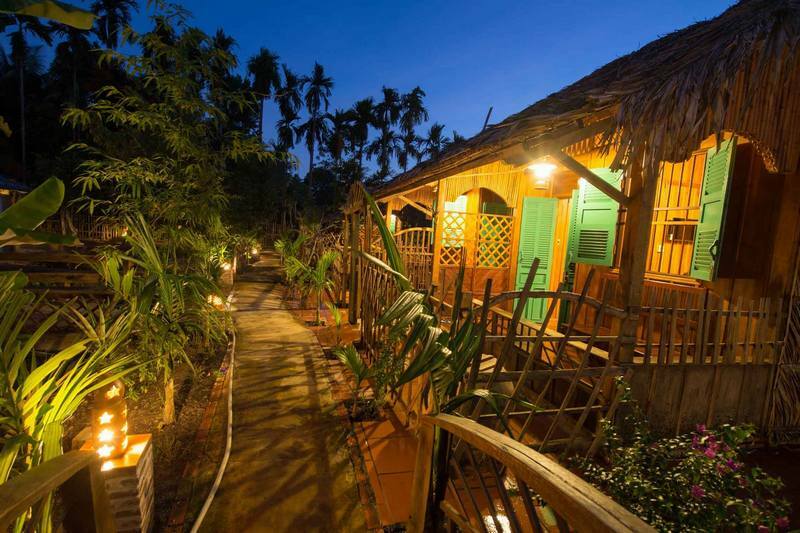 Located at Tien Thanh Beach, Green Papaya Organic Village Resort is surrounded by a traditional fishing village. This is an ideal place for tourists who trying to escape from the hustle and bustle of the city life. 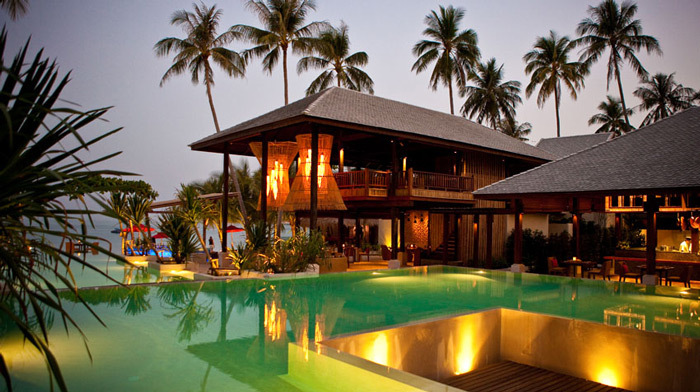 The resort has six villas along the coast, standing out by sophisticated carved Vietnamese furniture. Not just the environment-friendly architectural styles, the resort will also make you fall in love with their fresh garden. Vegetables from this garden will be the ingredients for your delicious seafood meal in the resort. One of the first five-star resorts in Vietnam, Anantara Mui Ne Resort can bring you unique and memorable experiences. 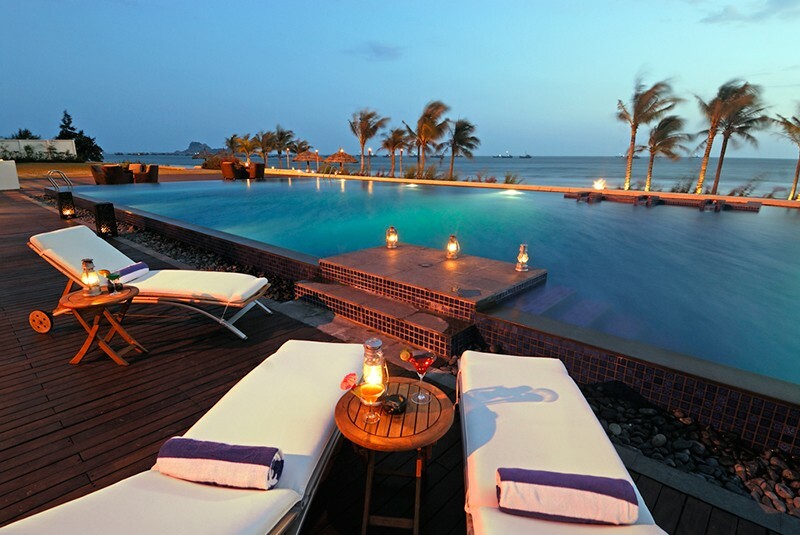 The resort has 89 rooms which are a harmonious combination between Vietnamese traditional and the contemporary design. Besides the private stone bathroom and swimming pool, there are also many gymnasiums with the shady garden frontage. The outdoor restaurant with high-quality facilities creates a luxurious and romantic space for you. Tourists can also take part in water activities on the beach or discover the local life in a nearby fishing village. 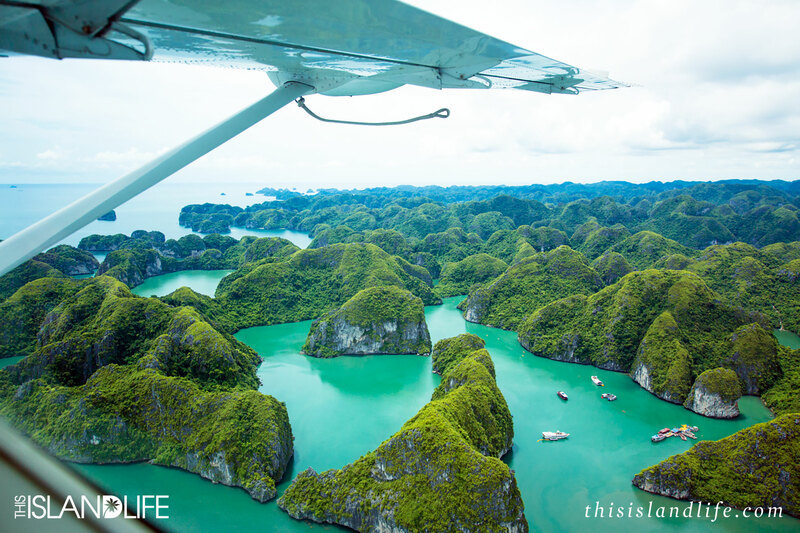 Imagine yourself on a rustic boat in the middle of a lush green world of a typical tropical forest, admire the very distinctive species you have never known of its existence. 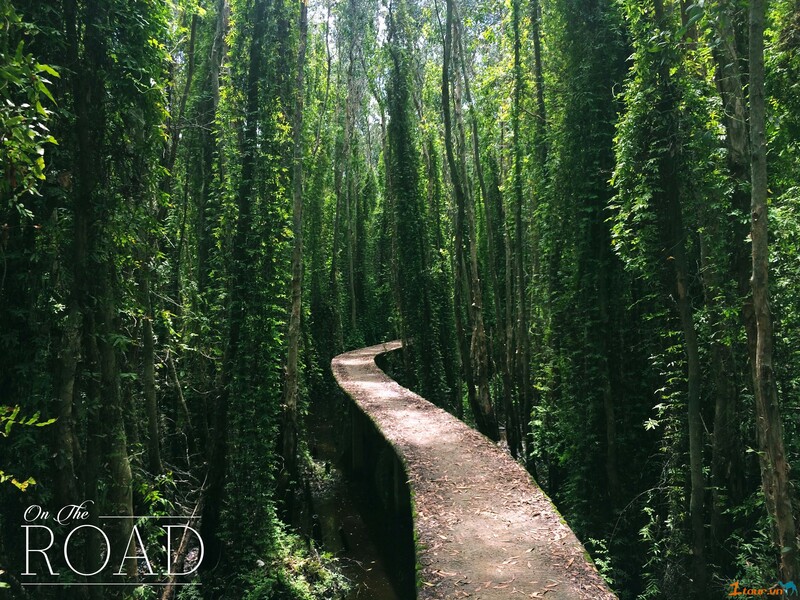 Come to these untouched forests of the Mekong Delta Vietnam and experience the most get-in-touch-with-nature moments of your life. Just about 20 km southwest from Chau Doc, Tra Su Forest is an evergreen ecosystem of cajuput trees lining in dusty paths and a flooded mangrove forest. The forest of 850 hectares is a natural paradise which homes 140 types of flora, 70 species of birds, 11 types of animals, 25 species of reptiles, and 23 kinds of fish. After getting on a rustic narrow boat, you will begin your journey into the world of an endless green. You will find yourselves zipping through a living carpet of water lettuce, so dense that you might forget that you are actually on the water. It costs 150,000 VND ($6.66 USD) for a boat. So if you are by yourself see if you can split a boat with another group. 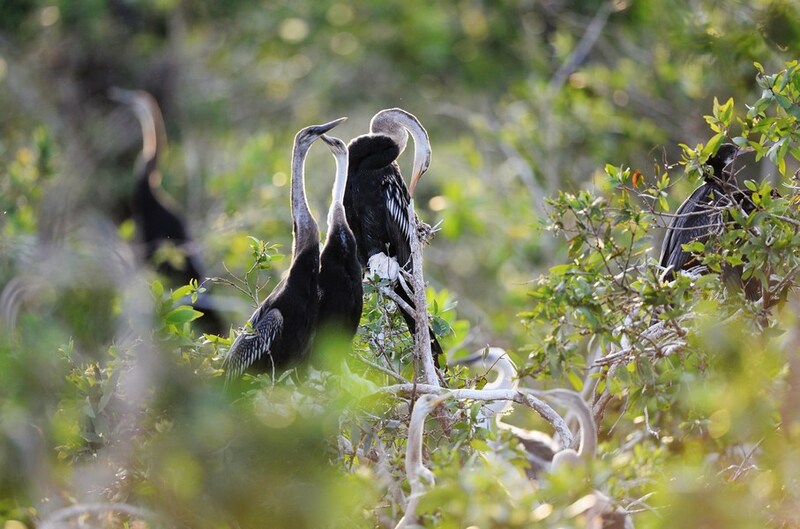 The picturesque Tram Chim National Park, awash with tall grass, homes over 230 different birds, from slender-necked storks to the towering sarus cranes. The national park spreads around on 7,000 hectares of waterlogged land. 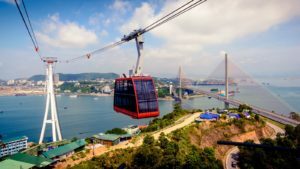 Visit Tram Chim Park, you will have chance to admire the majestic flooded forests on boat, which will come within a few hundred meters from the various species of birds. You might also want to see the panoramas of the park’s greenery and birds in flight from the watchtower. There are several different routes for you to go around the park. 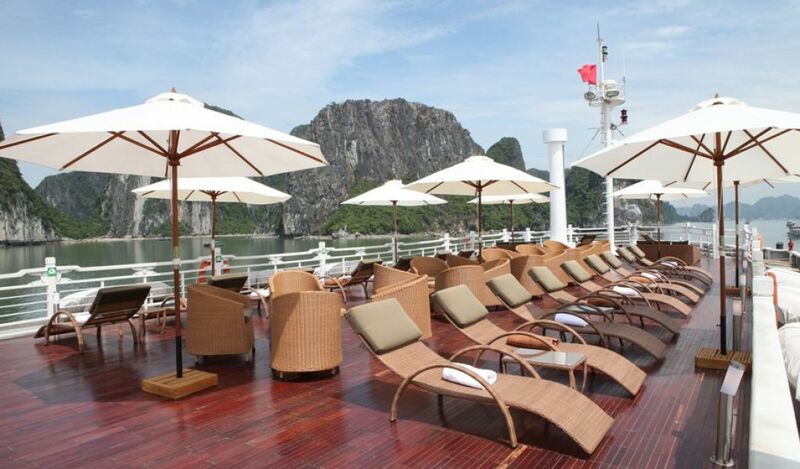 The shortest route lasts for about 45 minutes (VND500,000 per boat) offer you a brief glimpse of the park. Longer routes will take you deeper into bird-watching territory. Tan Lap floating village is an attractive tourism destination, exclusively for young backpackers. Located in the heart of Dong Thap Muoi Area, the village is a typical flooded land of the region. It is home to cajuput forest, lotus – water lily, water hyacinth, wild rice and hundred species of birds and fishes. Visit Tan Lap Floating Village Eco-tourism Site, you will have chance to walk on the path through cajuput forest and enjoy the panorama view of the cajuput forest from the observation tower. You may also want to take a boat along Rung Canal. It only costs 50,000 VND for one ticket with rowing boat and 130,000 VND for motorboat. The boatman will guide you to explore and learn about the vast eco-system of the forest. 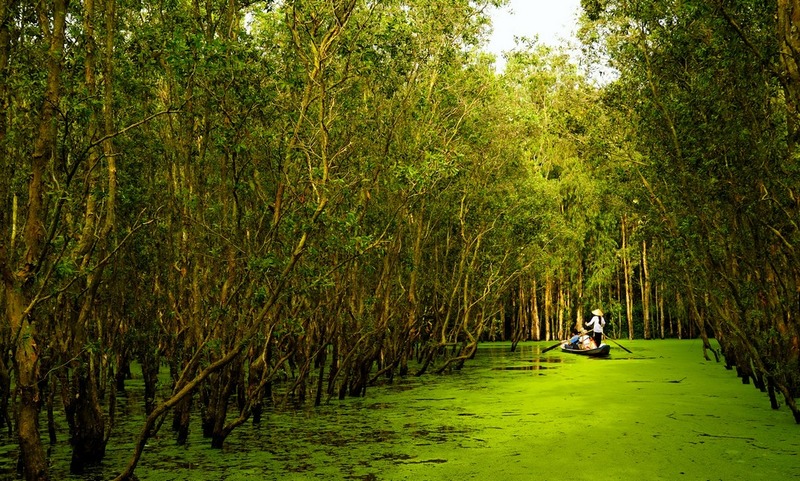 Located in the southermost province of Ca Mau, U Minh Ha National Park is another natural gift of the Mekong Delta Vietnam. 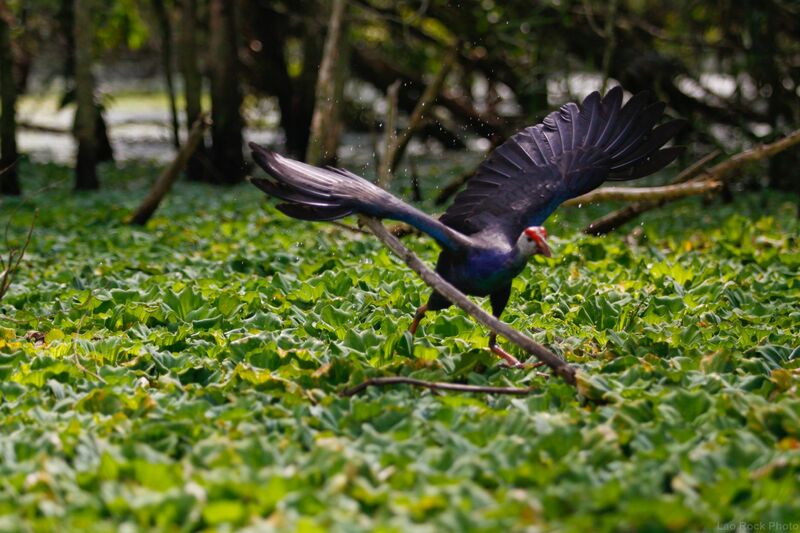 The 8,000ha national park has diverse varieties of flora and fauna typical of a seasonal wetland. The flora system includes immense cajuput forests on peat soil, seasonally flooded grasslands and vacant swamps. Visitors can use a boat or take in views from a 25-metre high tower. Freshwater fish are now reproducing in the park’s submerged forests. Visitors can join local people to fish, or collect honey from beehives. 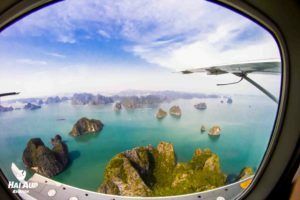 Vietnam is one of the most affordable travel destinations in Asia, where budget-conscious tourists can enjoy a wide range of activities, attractions, and local delicacies. 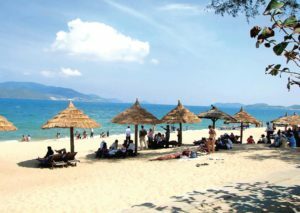 Follow our Vietnam travel tips on how to save money in Vietnam, which comprises essential aspects such as accommodation, dining, and shopping. 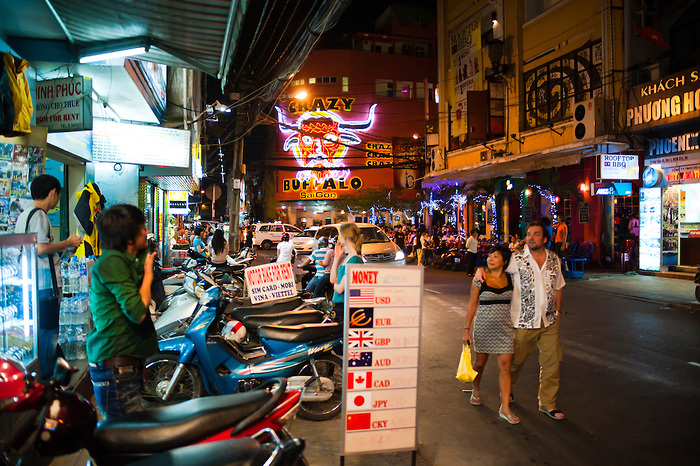 Vietnam has recently become a popular destination for tourists, therefore a lot of restaurants and hostels serve Western food with a rather higher price. However, this is rarely worth the extra cost since the local street food is cheap and yet very delicious. Often times the most authentic dishes can be found in roadside eateries, vibrant markets, and food carts. Eating at street stalls is not only the best ways to discover Vietnamese cuisine, but is also incredibly cheap. For example, a bowl of Phở costs just about 40,000 VND (less than $2). Rice dishes, banh mi, spring rolls, and banh xeo are often at a similar price. Pick a stand, do what the locals do and go for it. 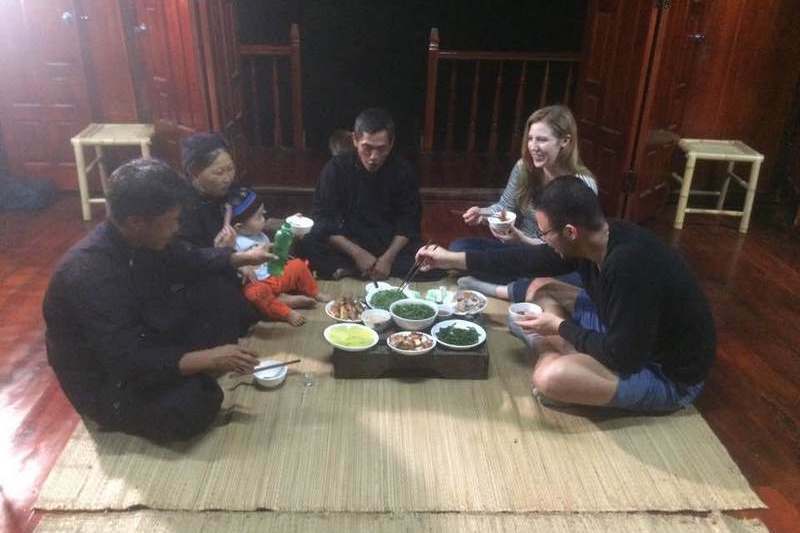 If you want a truly authentic Vietnamese dining experience, eat a meal with a local family in home-stay or learn to cook the dishes with cooking classes. Beer in a Southeast Asian country like Vietnam is cheap. A bottle of Tiger or Saigon costs you around VND 20,000 (under $1). However, there’s an even much cheaper one is ‘bia hoi’. This ‘cheapest beer in the world’ is a draught beer freshly brewed on the day and served from a keg or container on the side of the street. Nothing beats sitting on a street corner on a plastic chair, sipping this cheap and cheerful beer at around 15-30 cents. If you’re in Hanoi, Bia Hoi Junction in the Old Quarter is a great place to sit and watch the world go by. However, there’s a drawback that it contains only 4% of alcohol. So if it’s not enough, beers such as Tiger are available. Shopping is one of the best things to do in Vietnam, here you can find unique handicrafts and local food at relatively affordable prices. However, selling and buying in Vietnam tend to need some tactics. As a tourist, you should expect to be charged more than the true price of an item or service, but don’t take it too serious cause that’s just the way it goes around here. Be confident and find ways of bargaining. Also, take your time searching for good Vietnamese souvenirs and gifts for your family and friends. Aobaba Hoi An is family-owned tailor shop in Hoi An Ancient Town that’s gained massive popularity amongst travellers for its extensive textile collection and impeccable tailoring services. You can either choose a design from its up-to-date catalogue books or bring a picture of your favourite designer outfit and have it made to measure here. Most suits, dresses, and jackets can be tailored within 24 hours but if you’re pressed for time, Aobaba Hoi An can deliver the finished product to your hotel. Set along Tran Phu Street, the tailor shop is a five-minute walk from the Fujian Assembly Hall.